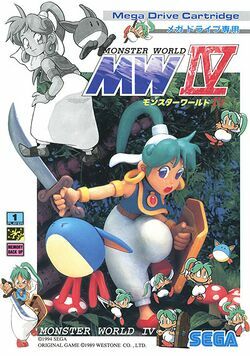 Monster World IV is widely held by English-speaking fans as one of the Sega Genesis' finest titles, despite the language barrier. As a late entry in the Genesis' lineup it really shows the power of the system: brightly-colored visuals, multiple simultaneous layers of parallax, tight controls and quality sound effects all illustrate the Genesis' true potential. The game is currently available via GameTap (although in Japanese) and was also released on the PlayStation 2 in Japan as part of Sega Ages 2500 Series Vol. 29: Monster World Complete Collection. It was finally officially released in English in 2012 for the Wii and PlayStation 3 as a standalone release and on the Xbox 360 as part of the Sega Vintage Collection: Monster World compilation. This page was last edited on 24 November 2014, at 09:18. This page has been accessed 30,920 times.